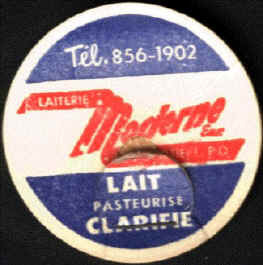 In August 2000, I went to La Pocatière and I had the information that this dairy started in early 40's. It was founded by M. François Martin, son of the farmer "Blanc" Martin. 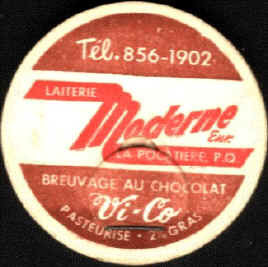 The dairy was situated at 403, 8th Street or Maurais Street. Today, an apartment building is at this address. 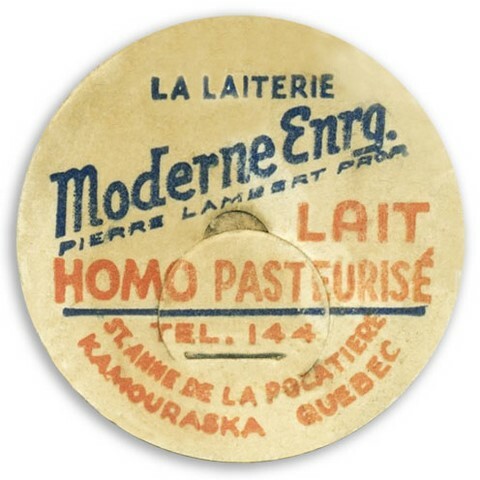 By the end of the 40's, the dairy was sold to M. Pierre Lambert. Mr. Lambert is deceased but Mrs. Lambert is still living in La Pocatière. Source: Mr. Guy Rouleau living on 9th Street La Pocatière. 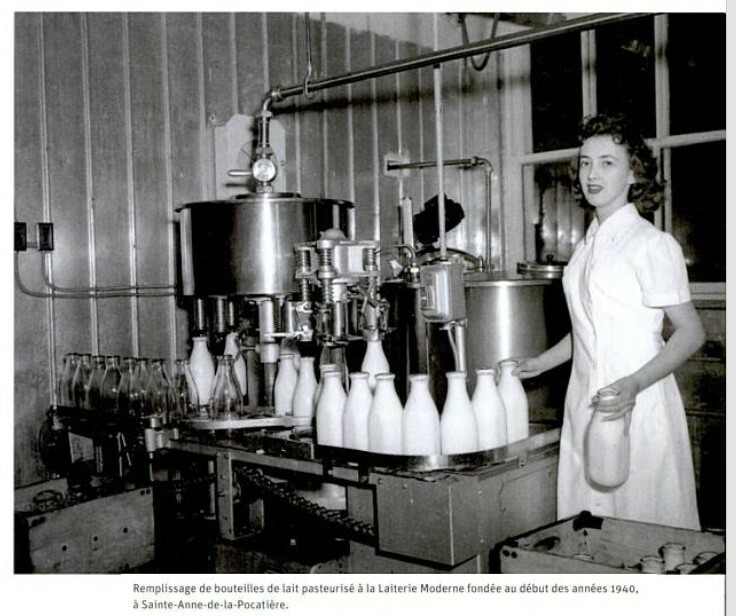 Mr. Rouleau worked at this dairy till 1963. He told that the dairy ceased to operate a few years after he quit working there and that all the buildings were sold. 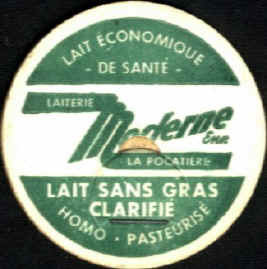 Other detail : Mr. Rouleau said that he never saw an identified (marked) bottle there, only plain glass, but caps were identified "Laiterie Moderne". Any of you have identified bottle! On the first cap we can read : "Ste-Anne-de-La Pocatière"
Ste-Anne-de-La Pocatière was a village till the early 1950. Today (2006), it is a city with a population of 6000. 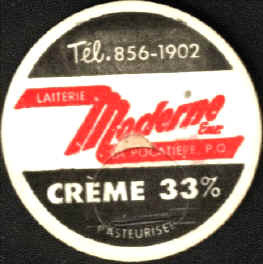 "Moderne Dairy" was always situated in the same area. When La Pocatière became a city, the parish of Ste-Anne-de-La Pocatière stayed because it was mostly composed of farmers. The "Richard Lambert" cap is a new cap but not a new dairy. 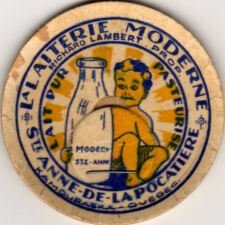 Richard Lambert was the first owner of the dairy and he sold it to his brother Pierre Lambert. 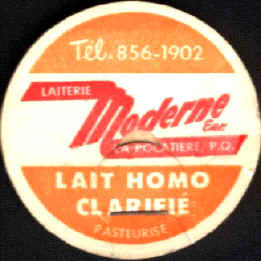 Claude Aubé said that he remember well the "Moderne Dairy" because he lived in La Pocatière for seven years.